My skull is still throbbing. Normally people complain about their ears ringing, but this goes some way beyond that. Sure, alcohol consumption, lack of sleep and draining travel have played a role, but for the most part, my current predicament is due to prolonged exposure to relentless, unforgiving noise, the likes of which even this regular ear-splitting gig-goer has rarely experienced. Even by The Twilight Sad’s standards, this was a loud one. As it happens, the two times I’ve caught Kilsyth’s finest in recent months have essentially bookended their dates supporting last year’s excellent No One Can Ever Know. The first, a stunning performance at Newcastle’s Cluny back in October, was the maiden leg of a full UK jaunt, while this final night of their latest Scottish mini-tour follows treks around the US (twice), mainland Europe and Ireland with nary a pause for breath. Thankfully, there were no signs of burnout at Dundee’s newly refurbished 20 Rocks; not least from the band’s heavy duty amplifiers, which were exercised to full capacity right from the get go. Opening with "Reflection Of The Television," the live quintet – guitarist Andy MacFarlane in particular – unleashed a savage barrage of sound lying somewhere between the sonic avenues of wind tunnel and warzone - and that was before it even kicked into gear! The bedlam which followed was as awe-inspiring as it was painful, but although the impossible to acclimatise to, the subsequent hour of brilliance crammed this sensory assault firmly to the back of listeners' minds. Currently celebrating 10 years together, core trio MacFarlane, singer James Graham and drummer Mark Devine’s rip-roaring performances are now accompanied by a near-perfect setlist incorporating every notable corner of their catalogue to date. An ideal equilibrium between 2007’s magnificent debut Fourteen Autumns And Fifteen Winters, 2009’s raw follow-up Forget The Night Ahead and last year’s delightfully bleak post-punk progression, it’s a routine which caters to every section of their fanbase, without a single dip or weak moment to speak of. That, though, is not to say there weren’t clear standouts. 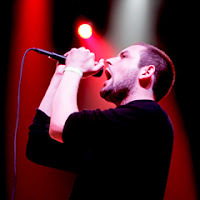 Recent cuts such as “Don’t Move,” “Dead City” and “Nil” for instance found frontman Graham at his most captivating, his intense on-stage demeanour perfectly complimenting their Joy Division-esque grooves and menacing undertones. These were only bettered by early favourite “And She Would Darken The Memory;” the singer’s majestic Glaswegian brogue towering above the din of his bandmates, projecting a passion and warmth few contemporaries can even hope to match. With only a solitary Glasgow date left on their schedule, The Twilight Sad now appear set for a well-earned break before returning to formulate No One Can Ever Know’s successor. It’s a tough ask – the record recently received a nomination for the prestigious Scottish Album of the Year prize, potentially accounting for their most impressive chapter yet. Whatever the outcome, however, the sensational standard of live shows such as this virtually entrench their standing among the nation's most important bands, and should ensure they remain crowd pleasers from some time yet. But Christ, they must get through some earplugs.